← Cute Dogs for Your Monday Blues! Jules Verne was Right Again! It is like a scene from an old wives’ tale about the giant, tentacled kraken dragging shipping vessels to their doom — two Humboldt squid, flashing an angry red, attack a Dual Deep Worker submersible containing two Greenpeace USA divers on an expedition in the Bering Sea. 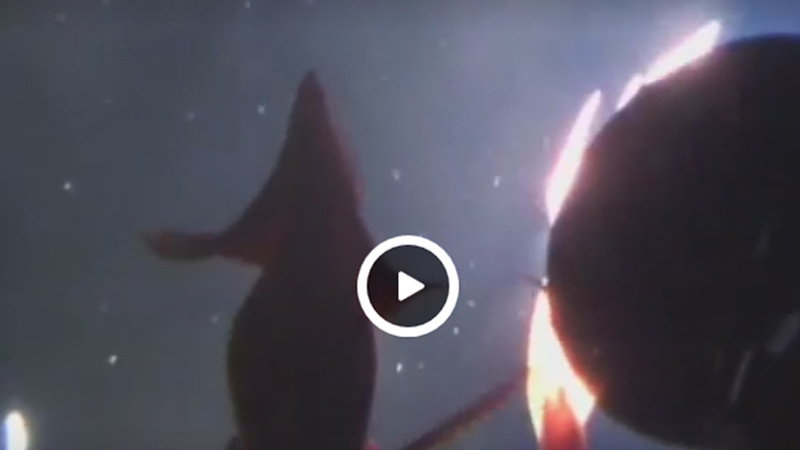 In a Vine video shot by one of the divers, the two large cephalopods, also commonly referred to as “jumbo squid” or “red devils,” rush at the submersible while spewing vision-obscuring clouds of ink. The video feeds the perception that the large mollusks – smaller than the elusive giant squid, but still weighing up to 100 pounds and measuring as long as 6.2 feet — are aggressively violent and dangerous to humans. The creatures typically range from 660 to 2,300 feet below the surface of the water, and roam off the coasts of British Columbia all the way down to Chile. In fact, its name is derived from the Humboldt Current off the western coast of South America. Much feared by fishermen and divers alike, the animals are said to be more aggressive than many of their calmer mollusk brethren like the octopus. The color-producing chromatophores in their skin generate a brilliant color display – switching from white to blood red — and many scientists believe the changes in hue are how the squid communicate with one another. Adding to their fearsome image, the animals possess over 100 suckers on their tentacles, each lined with sharp “teeth” used to dig into their prey. The creatures have long inspired writers and explorers alike. In a 2006 article for Outside Magazine, Tim Zimmermann describes an underwater encounter with the squid.